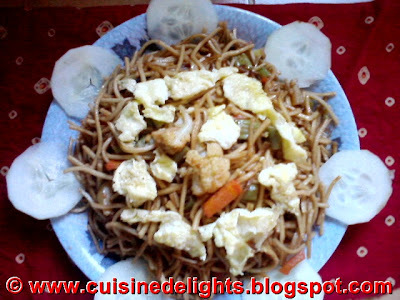 Chow mein is also common in Indian Chinese cuisine, having been introduced by the Chinese of Calcutta. It is usually offered Hakka or with gravy. Maggy masala : 1 tsp. Pour in the soya sauce,tomato sauce,chilli sauce and stir again.Atlast add maggy masala and mix well. Take out of flame, garnish with the scrambled eggs and serve with salad.